Need a Dose of Sherlock Holmes? As we wail and languish in fangirl purgatory waiting for Sherlock to come back we have a wealth of past Sherlock Holmes movies and shows to keep our addiction at bay. 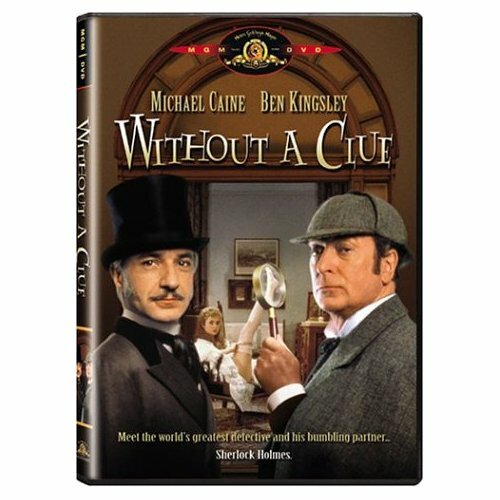 I just finished watching With Out A Clue a wonderfully funny Sherlock Holmes mystery filmed in 1988. Michael Caine plays Sherlock and Ben Kingsley plays Doctor Watson. Dr. Watson is the brilliant deductive mind and Holmes reminds me of Inspector Clouseau. WHAT DOES YOUR FAVORITE AUTHOR NEED? That one looks fabulous! Sherlock is still my favorite though. that sounds like a good one. 🙂 going to have to check it out.